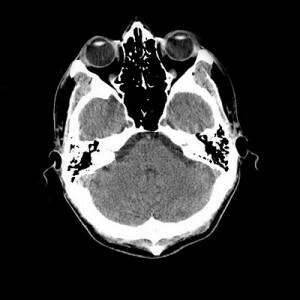 A computed tomography (CT) is the first diagnostic test used to diagnose a stroke. a CT scan uses X-rays to make detailed pictures of structures inside of the body. During the test, the patient lies on a table that is connected to the CT scanner. The scanner sends x-ray pulses though the body that takes pictures of thin slices of the brain, the images are saved to a computer where they can be viewed. An iodine dye (contrast material) is often used to make the brain easier to see on the CT pictures. The dye may be used to check the blood flow, find tumors, and look for other problems. CT pictures may be taken before and after the dye is used. A CT scan is an x-ray yest that is used to “see” inside the body. CT utilizes special x-ray equipment combined with computer technology. The patient lies down on a table, and is moved into the CT scanner for the testing. For CT scans of the head , most of the patient’s body stays outside the machine. The CT scanner takes “slices” of the tissue being examined. A CT scan of the brain takes less than 30 seconds to perform on a modern scanner. A CT scan is performed immediately on any new stroke patient. CT provides a picture of the brain which allows the differentiation of hemorrhagic from ischemic stroke. CT is valuable because it is fast, generally available (there is a CT scanner in the ED) at all times, and be performed on virtually any patient, including those with pacemakers and on ventilators. The disadvantage of CT scanning in acute stroke imaging is that it is relatively insensitive to early ischemic stroke changes even large strokes may not be visible immediately on CT, and it may miss strokes if they are small, or in such areas such as the brainstem which are difficult to image. A standard CT scan exposes the patient to a small amount of radiation.